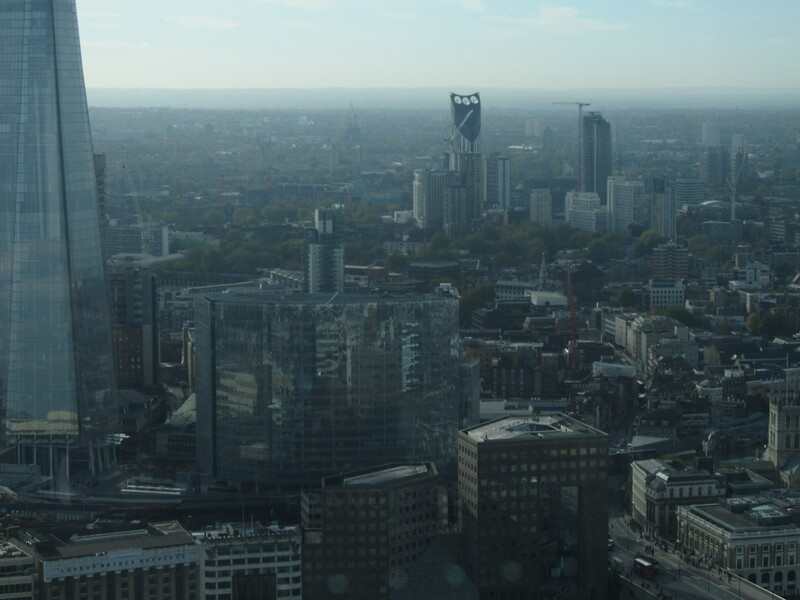 Incredible view of the London Skyline from the Sky Garden. The Sky Garden observation deck located at the top of the Walkie Talkie skyscraper in London. 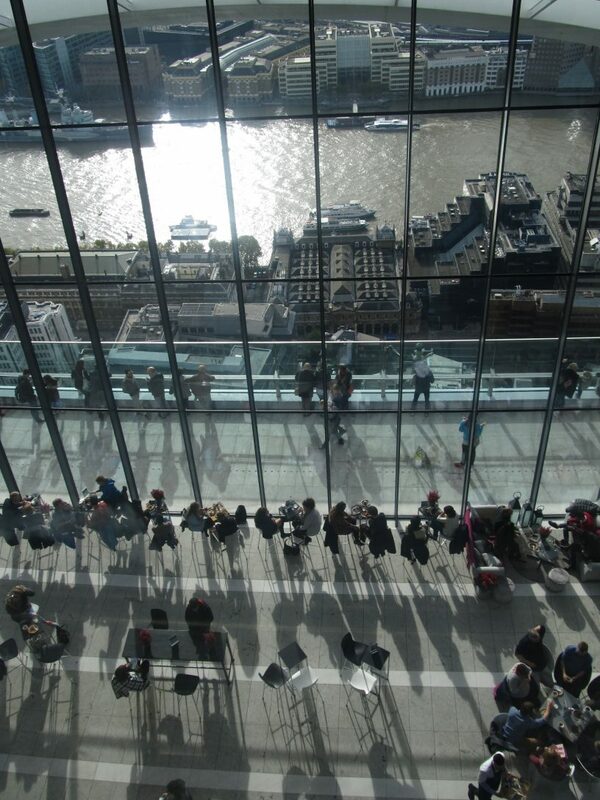 Visiting the Sky Garden is the cheapest way to see the London from the top. 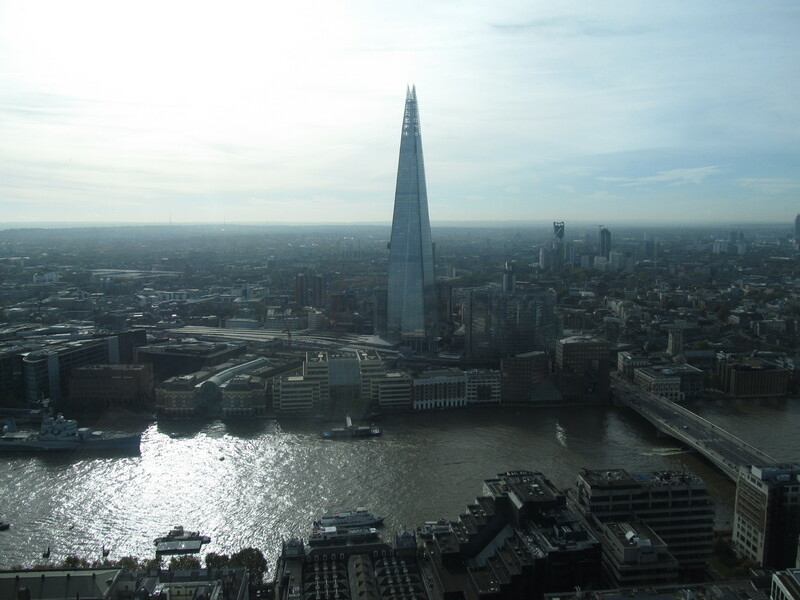 Recently I have written about London seen from The Shard. As we know getting into The Shard is not the cheapest experience. You have to pay 26GBP admission per person. 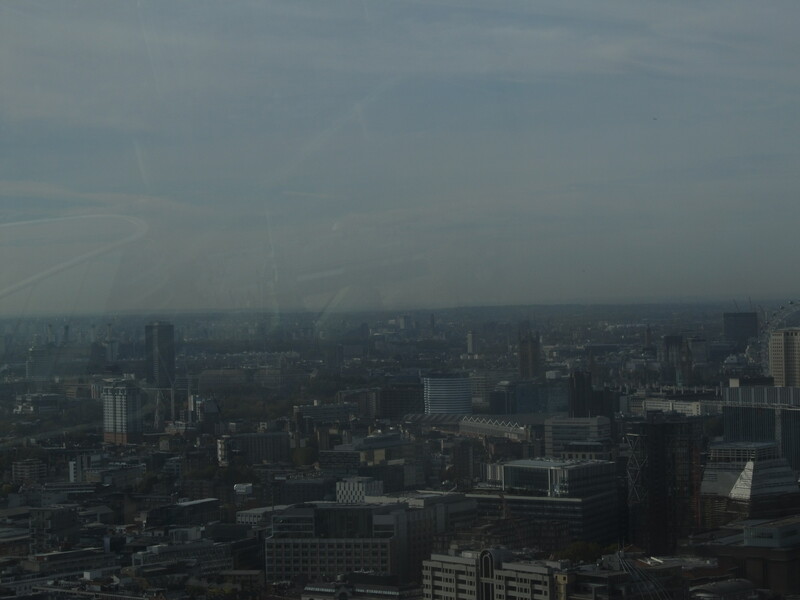 The Sky Garden gives you the opportunity to get a bird-eye view of London for free. The basic condition for it is making a booking a few weeks before. You can do it from this website. 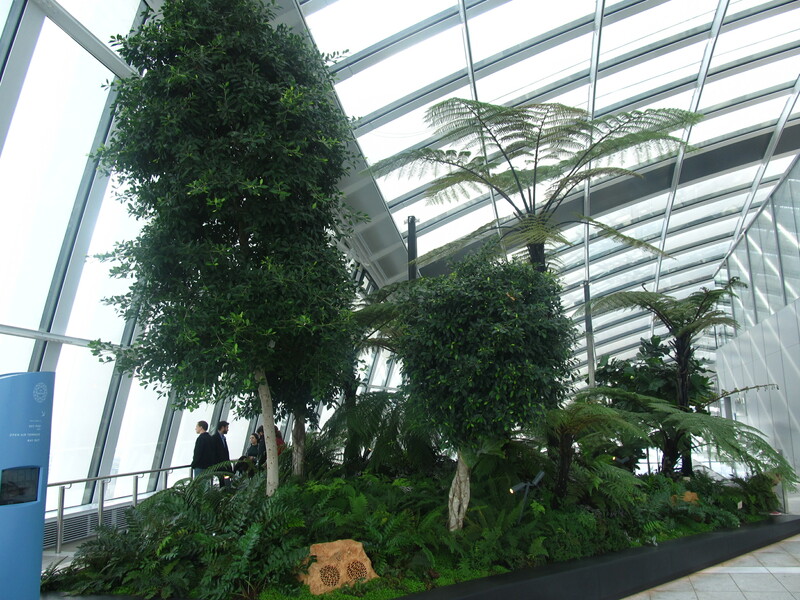 We came to the Sky Garden in late October on Sunday. Being in rush we reached main doors around 10:50am and could join to last group of people without payable admission. 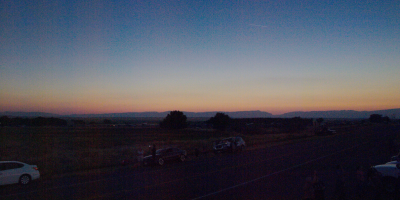 Only a few hours in the morning is reserved for this purpose. After 11am the admission is bookable with fee. After several seconds of fast trip by lift we entered to the Garden site. This place is amazing. The garden on the top looks awesome, however the vegetation look quite confined. 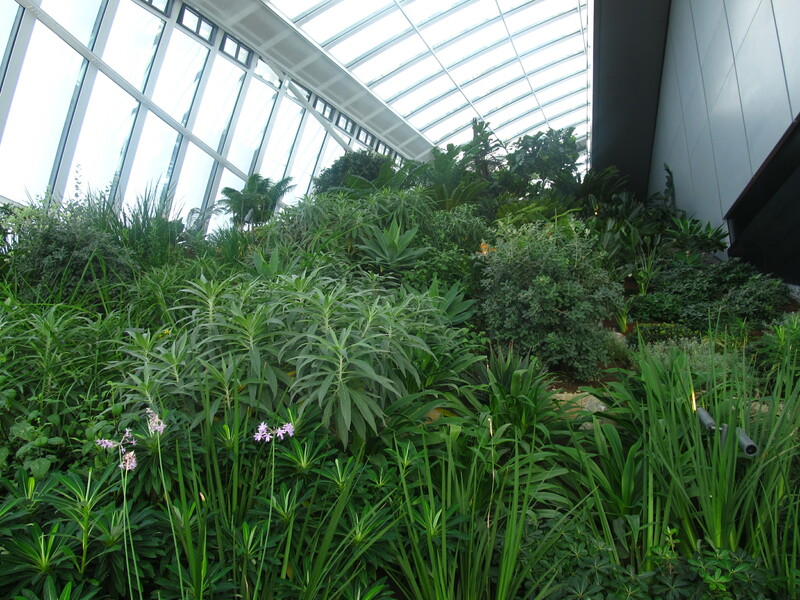 The plants are located in a few sections, that makes the garden fairly big. Everything looks very nice with a restaurant beyond, behind glass. Pic. 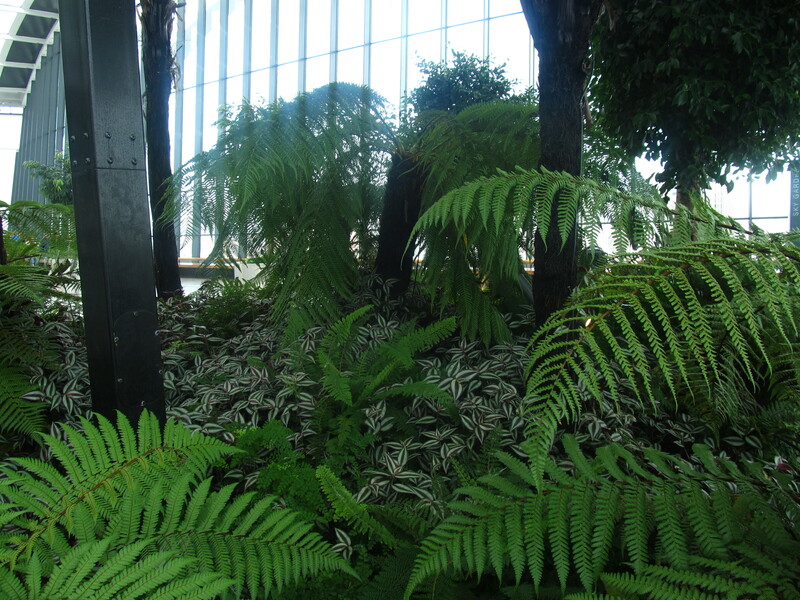 1 – 3 The vegetation in the Sky Garden. 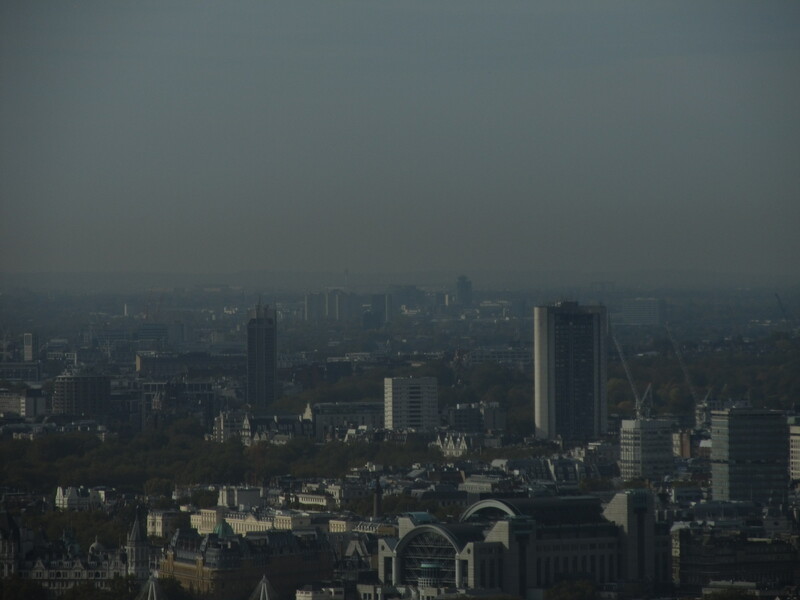 Anyway my basic aim of this visit was enjoying the beautiful panorama of Greater London and environs. 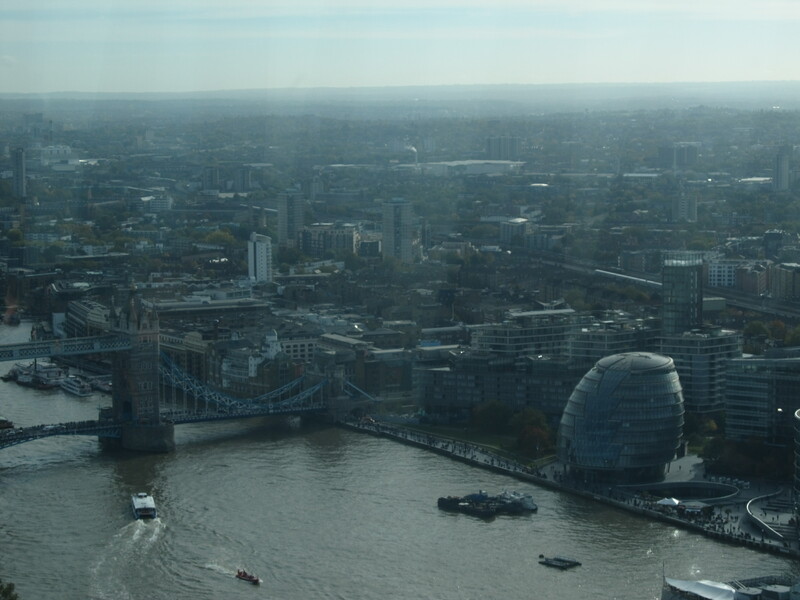 It was my first attempt to see London from this altitude, because I have visited the Shard nearly 1 year later. 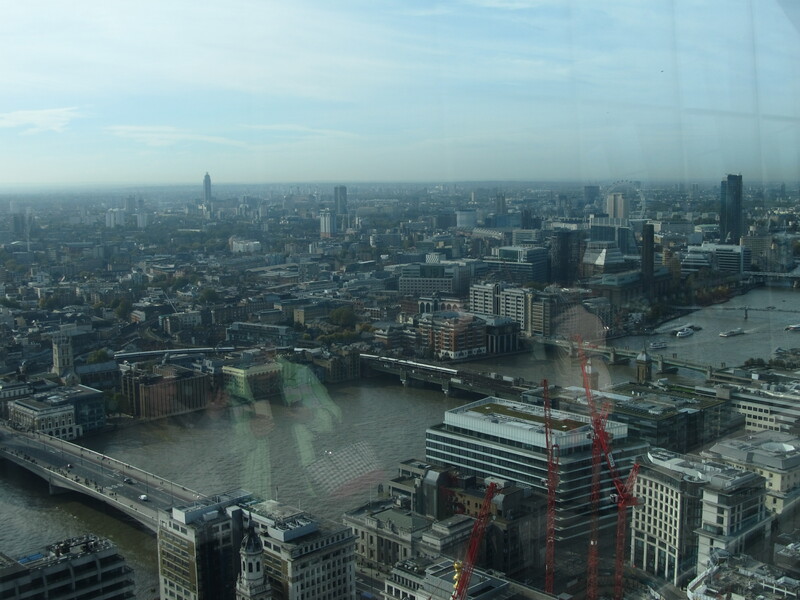 I can admit, that I was awestruck of the Bird’s eye perspective of the United Kingdom capital. 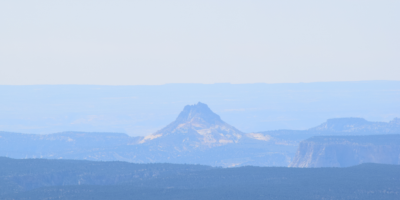 Unfortunately the visibility was not good that day. 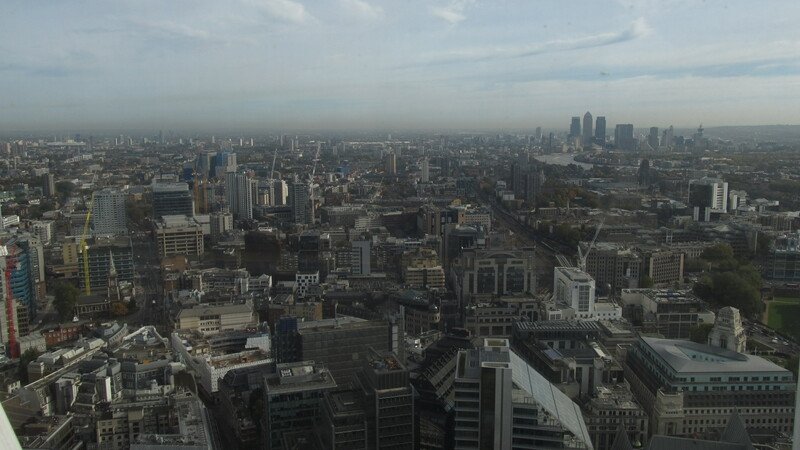 Comparing to the day, when I reached the top of the highest building in Europe the haze was thicker. It gaves me opportunity to have around 30 km line of sight. Because it was before I bought a DSLR camera I used my old Canon Powershoot SX 130 IS with 12x superzoom to enclose a distance objects. 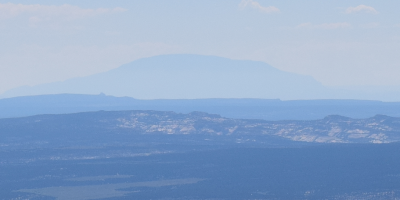 I put my photos from north direction following the azimuth route to make the landscape easy readable. 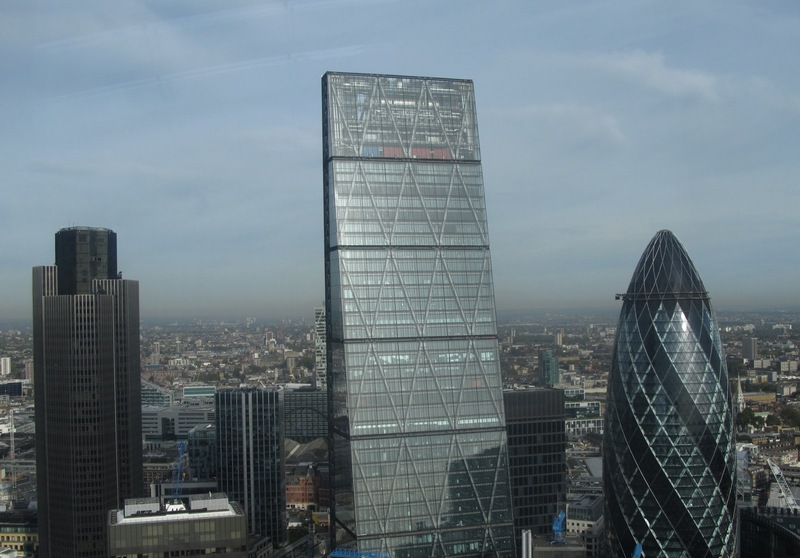 Let’s have a look on the most remarkable sights, that you can experience being at the top of the Walkie Talkie skyscraper. I would like clearly show you what exactly you can see from the Sky Garden. There is many places to cover. 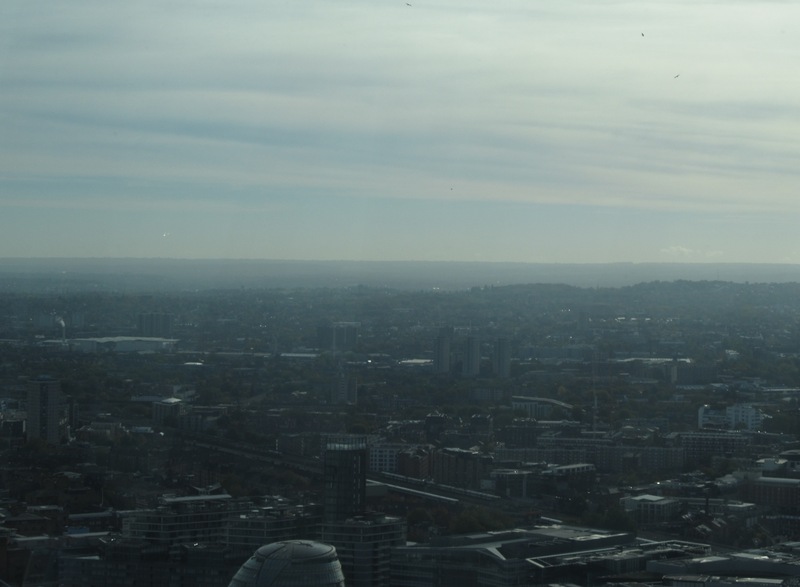 The viewpoint is around 50m lower than top of The Shard, though many spots of Greater London are still clearly visible. The basic disadvantages of taking picture throughour the glass are white ghosts caused by reflect the external light. At the outcome the quality of photos is quite poor. Pic. 4 The Tower 42, Ledenhall Building and 30st St. Mary’s Axe seen from the top of the Walkie Talkie skyscraper, click to enlarge. Pic. 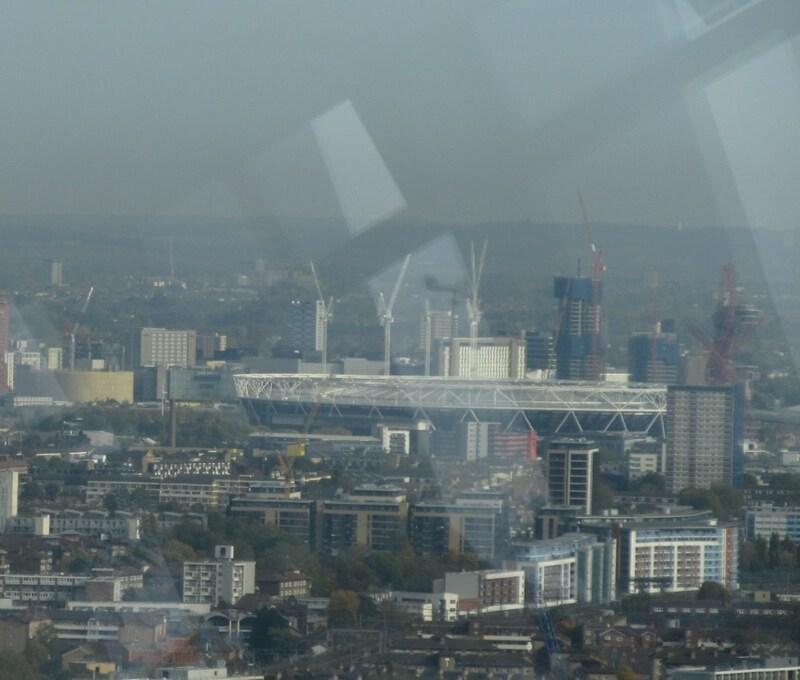 5 The Queen Elisabeth Olympic Park seen from the Sky Garden. Pic. 7 View towards the Orange Tree Hill (around 50m.a.s.l.) near Romford from 26 km distance, click to enlarge. Pic. 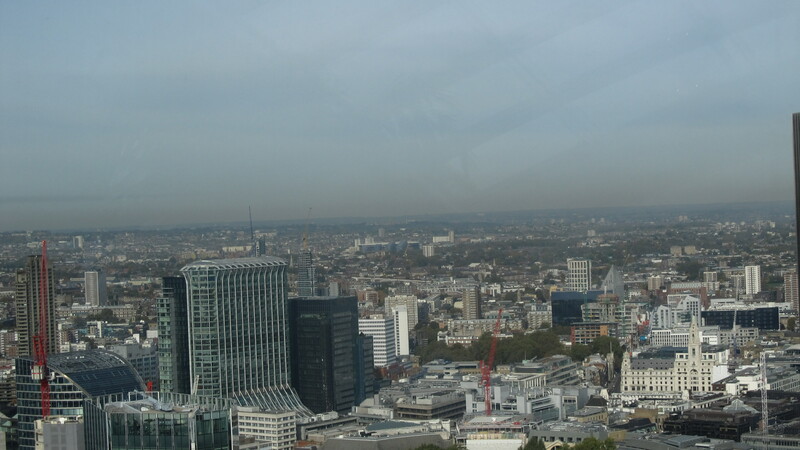 8 The eastern part of the Greater London seen from the Sky Garden, click to enlarge. Pic. 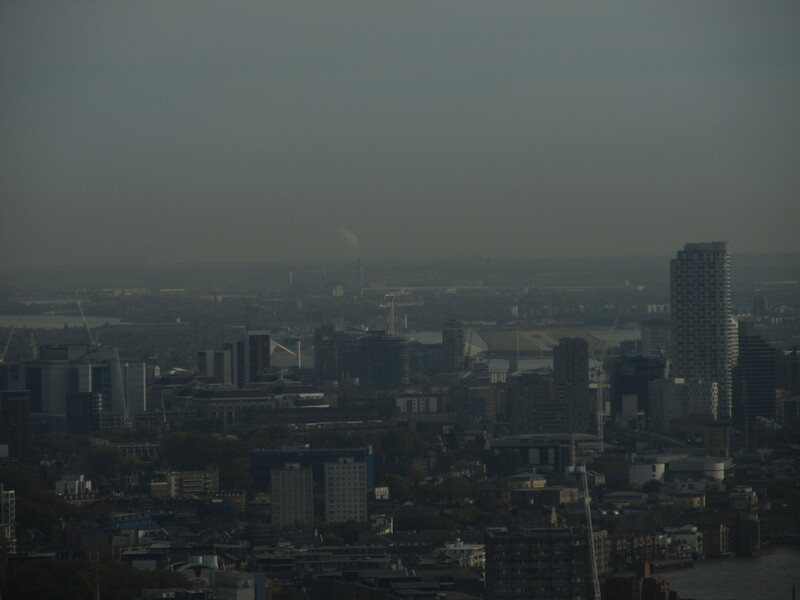 9 View on the London City Airport (LCY) and Edible Oils refinery in the background, click to enlarge. Pic. 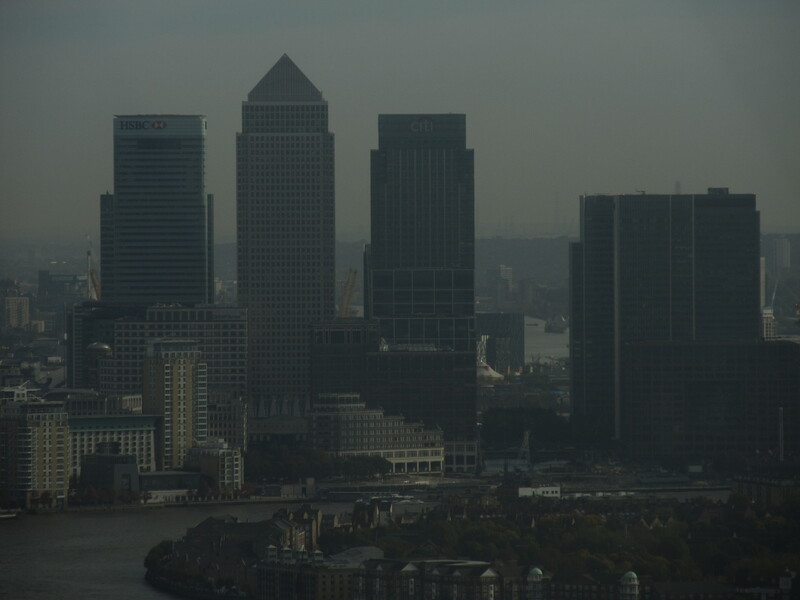 10 The Canary Wharf seen from the Walkie Talkie building, click to enlarge. Pic. 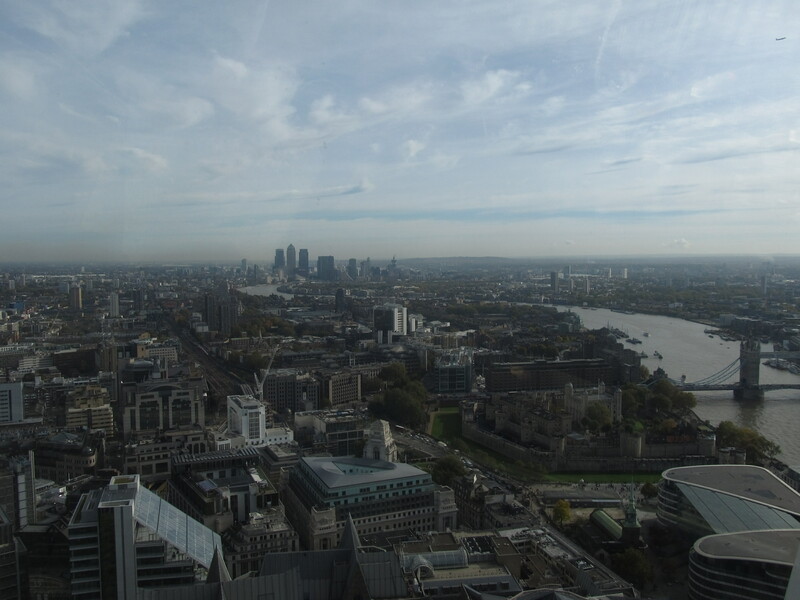 12 View on the eastern part of the Greater London with Canary Wharf and the Tower of London at the front, click to enlarge. Pic. 13 The Tower Bridge seen from the top of the Walkie Talkie skyscraper, click to enlarge. Pic. 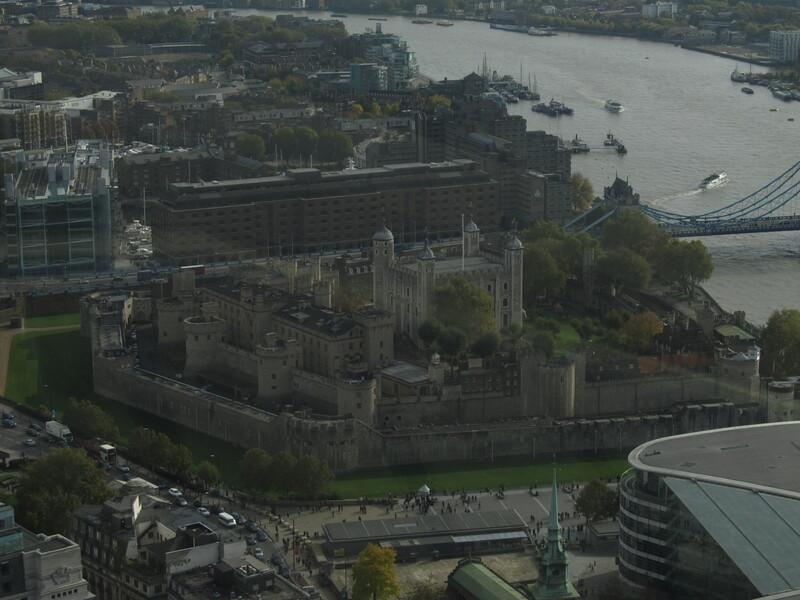 14 The Tower of London seen from the Sky Garden, click to enlarge. Pic. 15 View from the Sky Garden towards Brockley, Forest Hill and North Downs beyond on the left of course and the Mariner’s Hill community near Westerham (30 km distance) on the right hand side, click to enlarge. Pic. 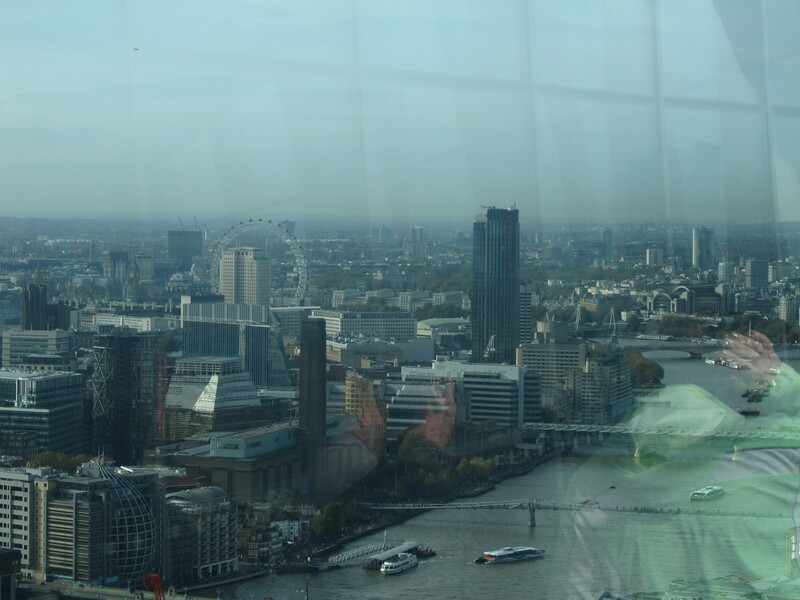 16 London City Hall and Thames rives seen from the Sky Garden, click to enlarge. Pic. 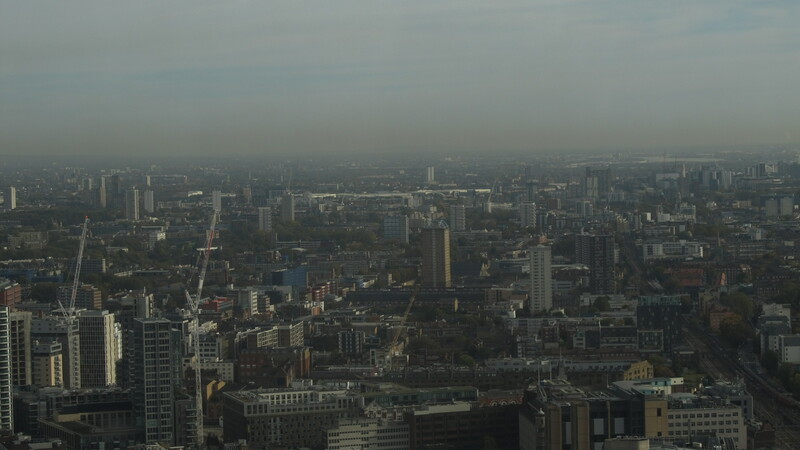 17 View from the Sky Garden towards the Westow Hill (112m.a.s.l.) – one of the highest hill in London and North Downs range 20km ahead, click to enlarge. Pic. 18 The Shard and south bank seen from the Sky Garden, see original image. Pic. 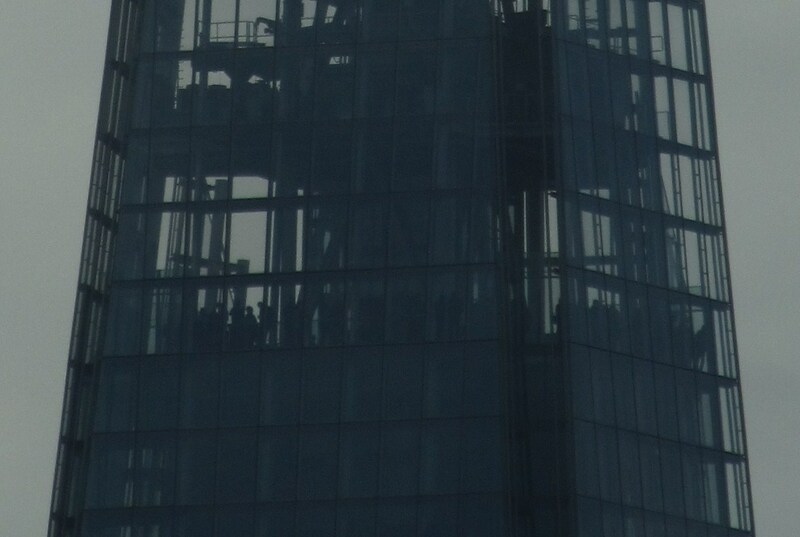 19 And take a detailed look on the Shard view platform and see the people there :), cropped picture, see the original image. Pic. 20 View from the Sky Garden towards the Strata residential building, click to enlarge. Pic. 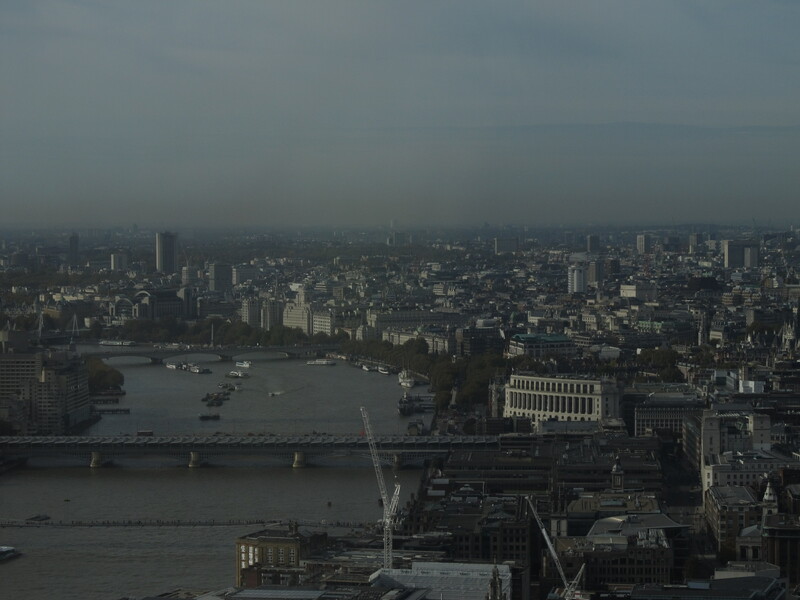 21 View on the Thames river and south bank from the Sky Garden, click to enlarge. Pic. 22 View on the St. George Wharf Tower and Battersea Powerplant station beyond, click to enlarge. Pic. 23 View on the Westminster with Palace of Westminster, Portland House and Chelsea beyond, click to enlarge. Pic. 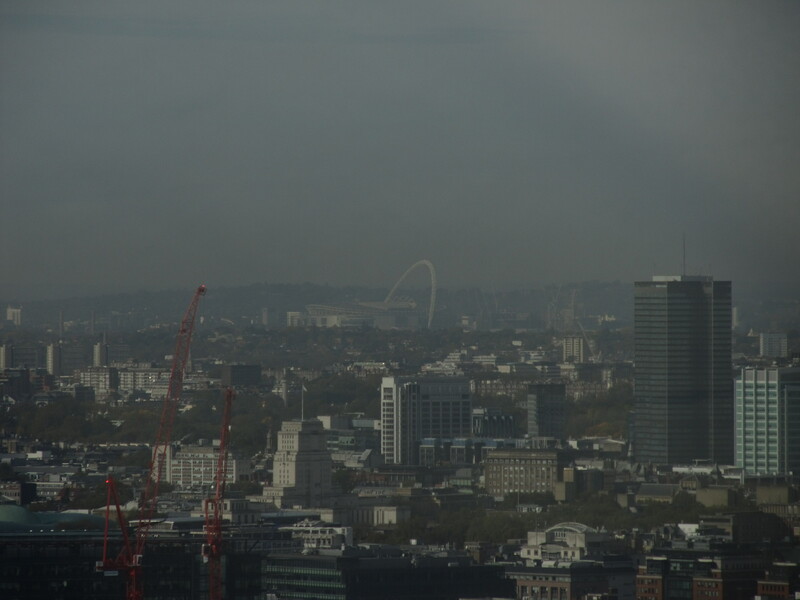 24 The London Eye seen from the Walkie Talkie building, click to enlarge. Pic. 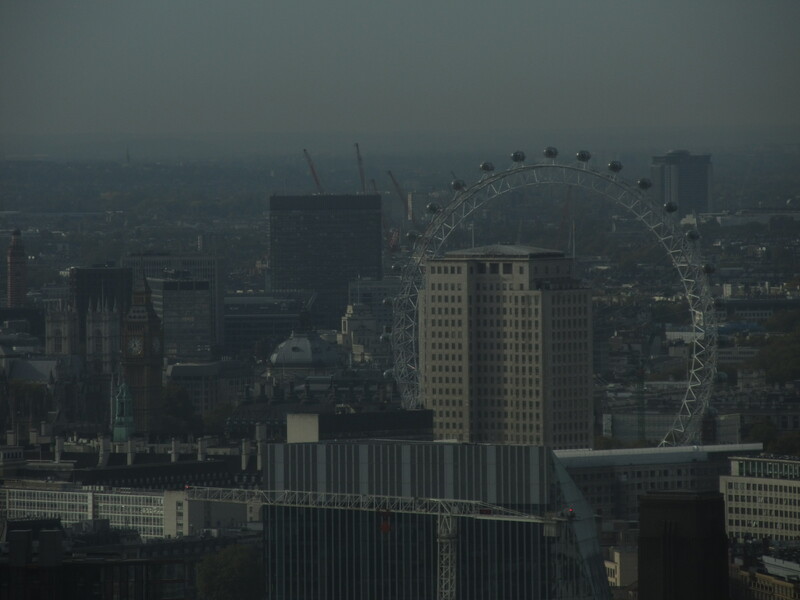 25 Zoom on the Big Ben and London Eye from the Sky Garden, click to enlarge. Pic. 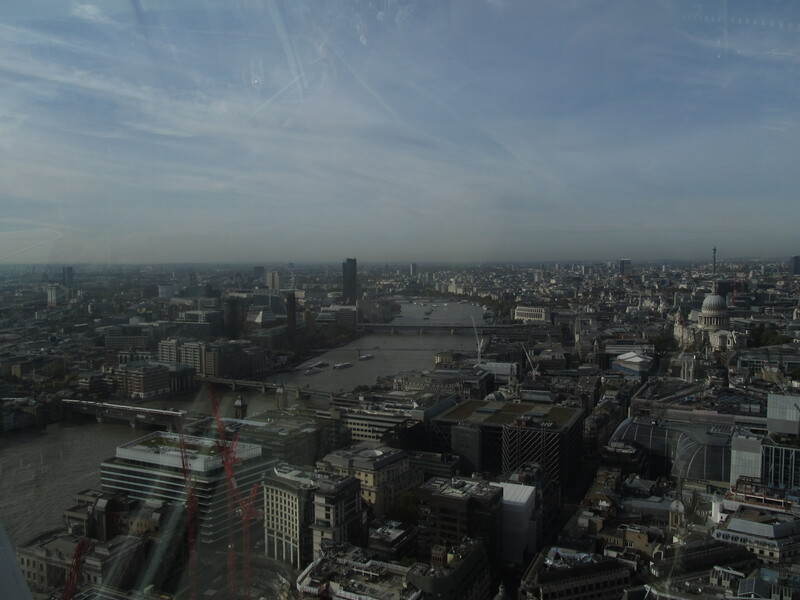 26 View from the Sky Garden on the Thames river and western part of the Greater London, click to enlarge. Pic. 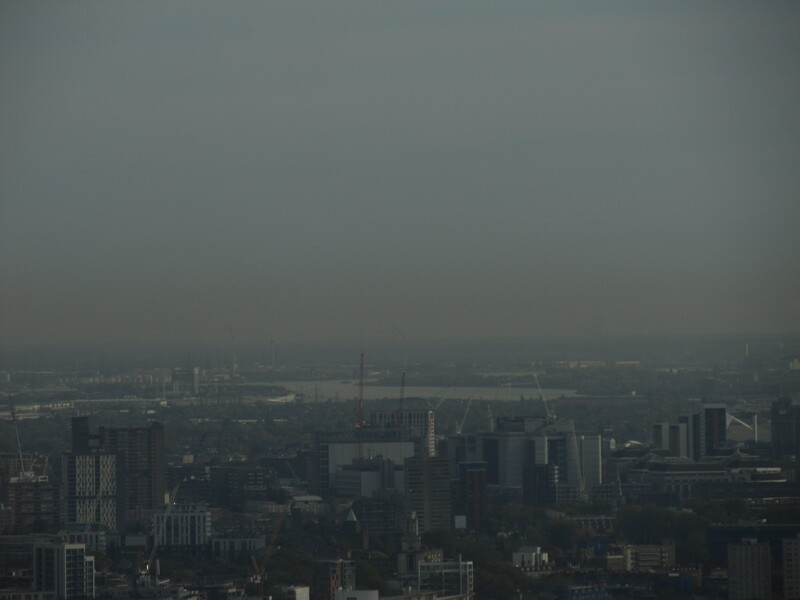 27 Zoom towards the London Hilton Building and the Heathrow Airport (LHR) beyond, click to enlarge. Pic. 28 View on the Thames river, the Shell Mex House, London Hilton Building, HyDe Park and Notting Hill area, click to enlarge. Pic. 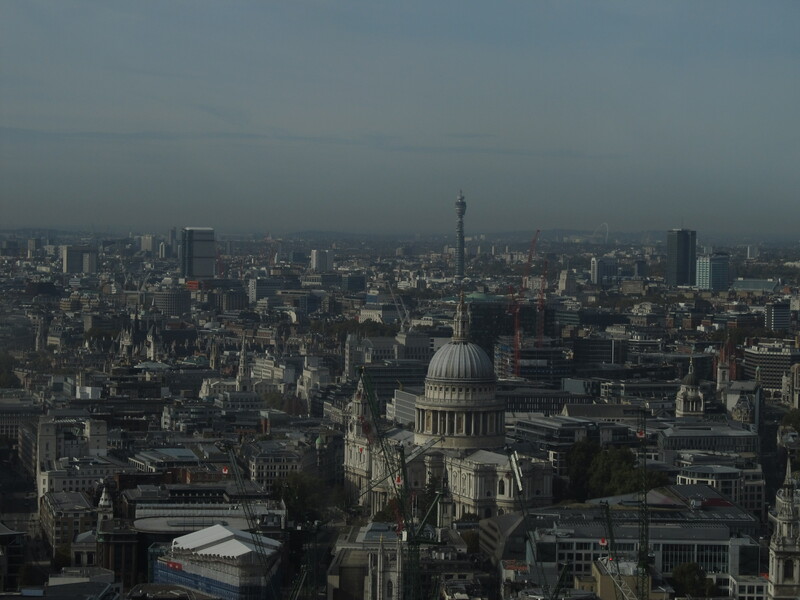 29 The St. Paul Cathedral and BT Tower seen from the Sky Garden, click to enlarge. Pic. 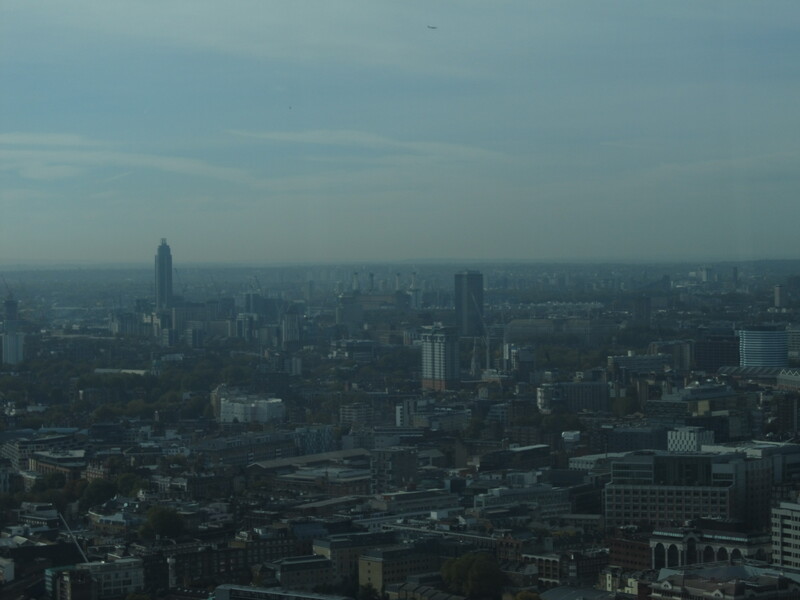 30 View from the top of the Walkie Talkie building on the University of London and the Wembley Stadium, click to enlarge. Pic. 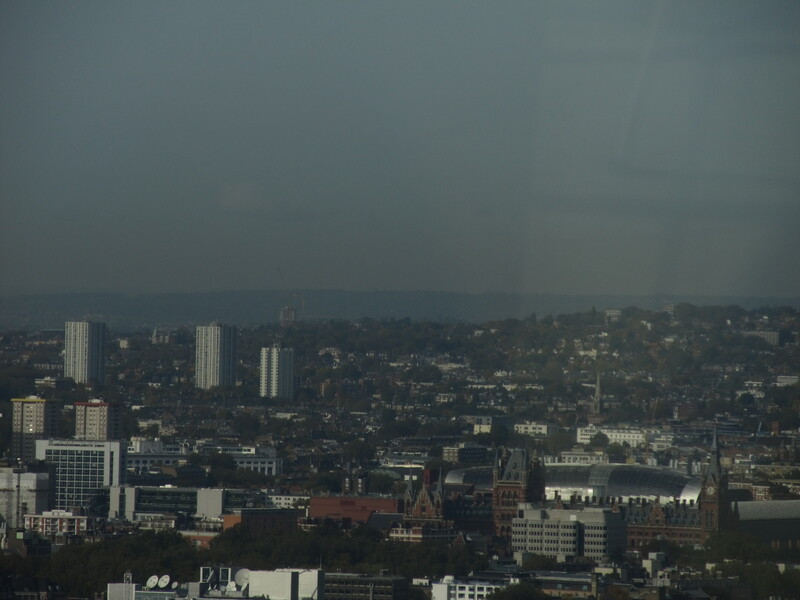 31 View from the Sky Garden towards the Pancras International rail station and Stanmore Hill (152m.a.s.l.) 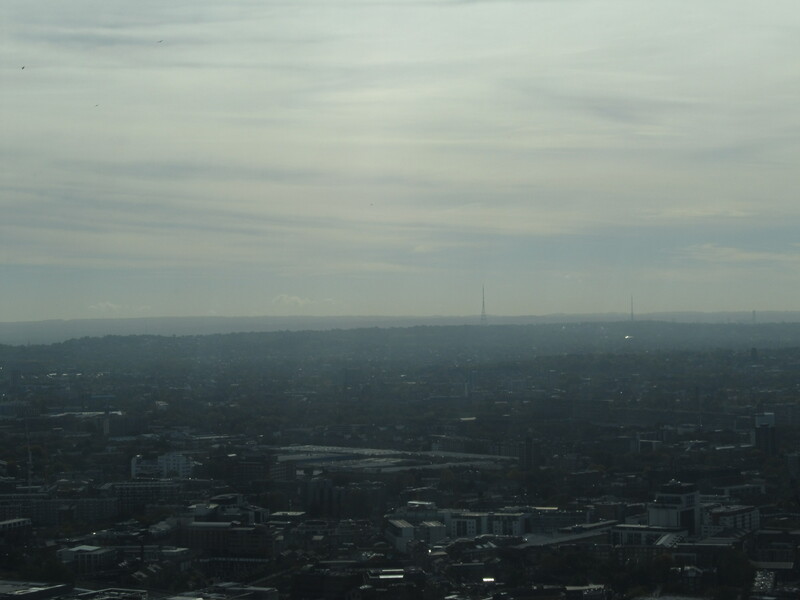 – 3rd the highest hill in the London area, Chiltern Hills beyond, click to enlarge. Pic. 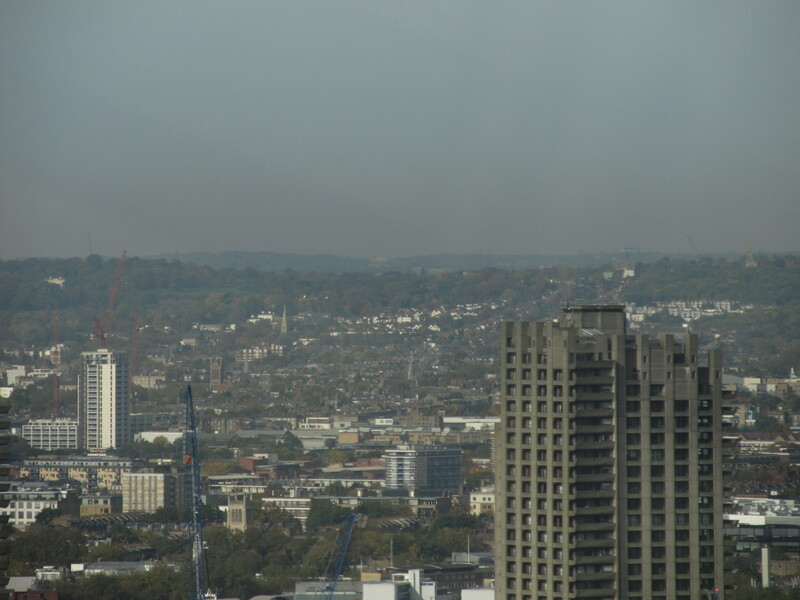 32 View towards the Barbican block of flats and Hampstead Hill (137m.a.s.l) – one of the highest hill in London Area with Kenwood House. Beyond the Mill Hill near Edgware with National Institute of Medical Research, click to enlarge. Pic. 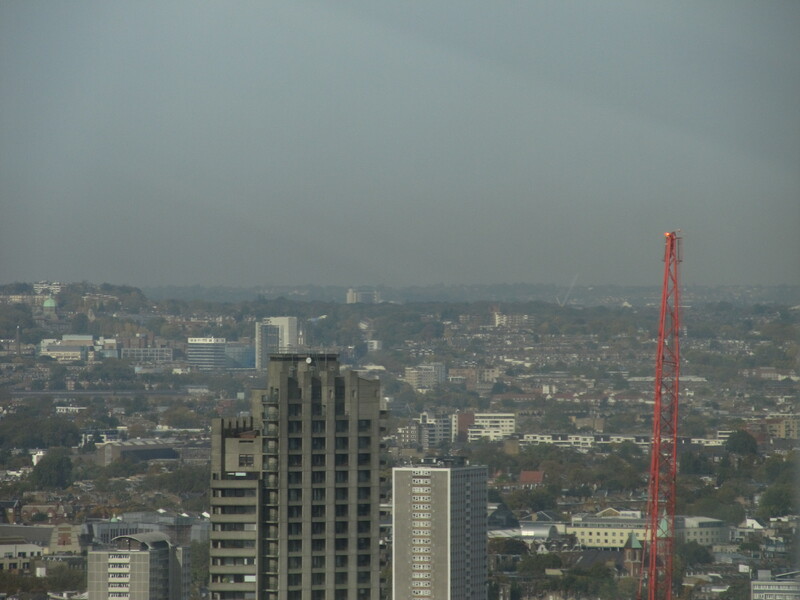 33 View towards the Barbican block of flats with Holloway and Highate districts beyond, click to enlarge. Pic. 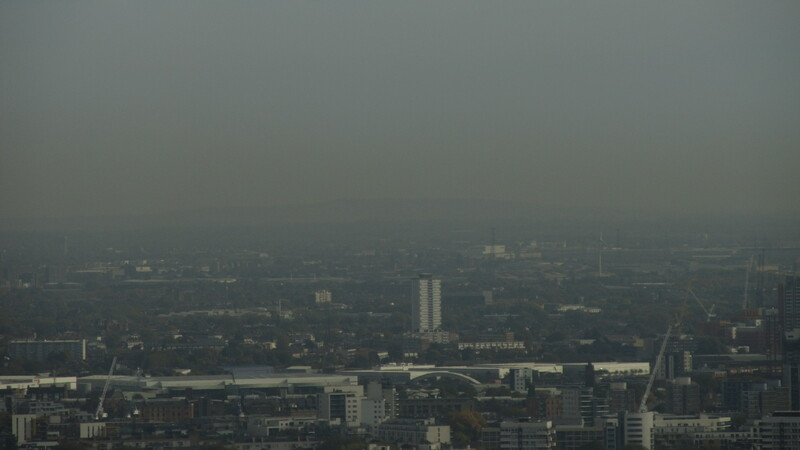 34 View from the Sky Garden on the Ebiquity building and towards the Emirates stadium and Alexandra Palace, click to enlarge. Pic. 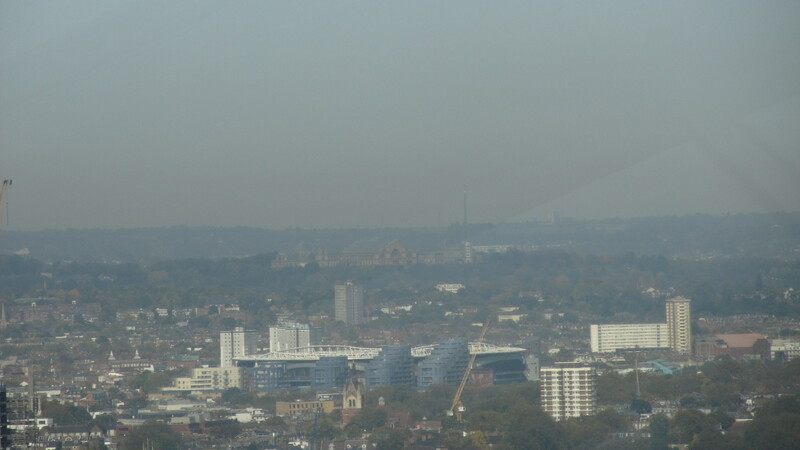 35 Zoom from the Walkie Talkie building on the Emirates (Arsenal) football stadium and Alexandra Palace beyond, see the original image. 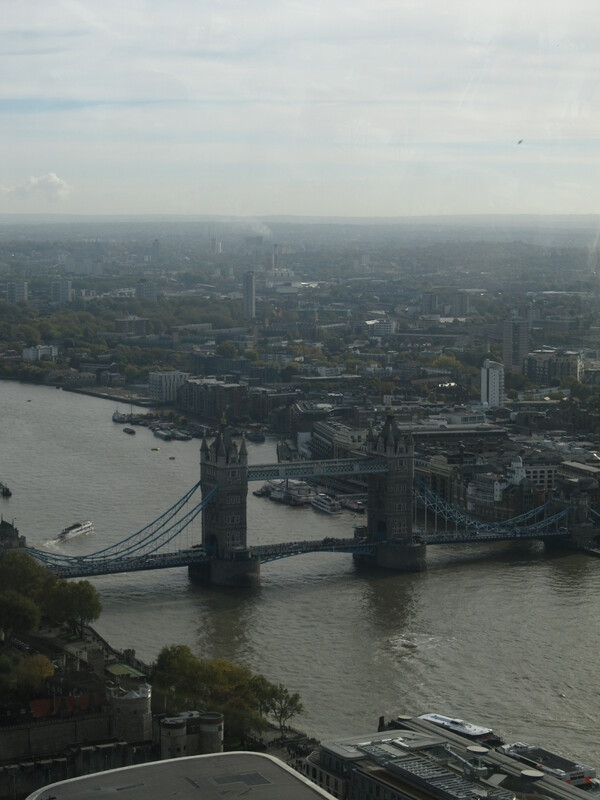 Places with the best view of London and everything what you need to know about visit these places.